An innovative present-day science fiction thriller, Face/Off packs crackling kinetic energy into the story of a long-running feud between an international terrorist and an FBI agent. FBI Agent Sean Archer (John Travolta) has been pursuing terrorist Castor Troy (Nicolas Cage) for a long time. Six years prior, Castor tried to assassinate Archer, but succeeded only in killing his young son Michael instead. Now Archer appears to have the upper hand: an FBI trap at a small airport results in the apparently mortal wounding of Castor and the capture of his brother Pollux (Alessandro Nivola), but not before Castor hints that a massive bomb has been hidden and activated somewhere in Los Angeles. Castor is kept alive at a covert government medical facility. To trick the imprisoned Pollux into revealing the location of the bomb, a secret plan is hatched: Castor's face will be peeled off and attached to Archer, whose own face will stored for later reattachment. The plan appears to work, Archer (with Castor's face) tricks Pollux into giving away the bomb's location. But all goes awry when Castor wakes up, summons his allies, and attaches Archer's face onto his head. Castor (with Archer's face) takes over Archer's job and household, including sleeping with Archer's wife Eve (Joan Allen). Archer has to find a way to reclaim his identity, rescue his family, save his life and destroy the rampaging Castor. Director John Woo not only conjures up an imaginative science fiction adventure, but also creates one of the most thrilling action films of the late 1990s. 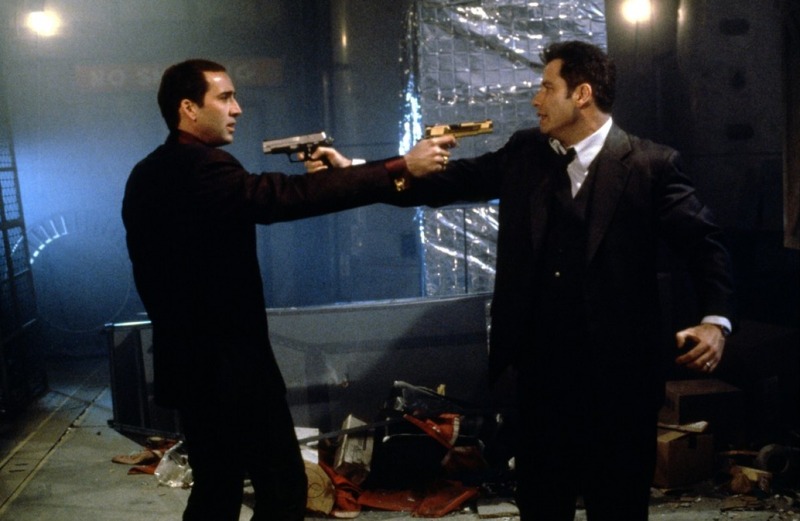 Written by Mike Werb and Michael Colleary,Face/Off is understandably silly when it comes to the science, but the premise is put to good use. Woo uses the face exchange between mortal enemies as a starting point for a non-stop fun ride featuring no end of chases, bullet-drenched shoot-outs and general mayhem, all stylistically filmed with balletic elegance. This is an action film where all the action scenes are lovingly constructed with artistic choreography, the horizontal leap-and-shoot a favourite tactic, only surpassed by the higher difficulty level of the horizontal leap-twist-and-shoot. 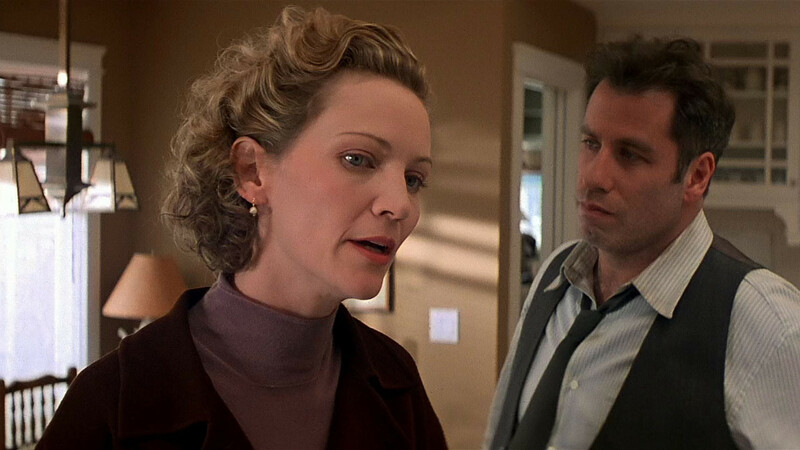 At a length of 139 minutes, Face/Off is pretty long for what is fundamentally a two-person duel. Woo stretches out his action scenes with the care of a creator unable to trim his lovingly-conceived achievement. While understandable given the quality on display, the film almost becomes too much of a good thing, and also means that Archer and Castor emerge as really horrible marksmen. They take hundreds of shots at each other throughout the movie, and neither the ace FBI agent nor the renowned terrorist cover themselves in glory when it comes to accuracy. John Travolta and Nicolas Cage each get two characters to sink their teeth into, and both actors have rarely been better. When the actors switch roles and have to pretend to be their characters' worst nightmare, they excel in contrasting manners. Cage (as Archer with Castor's face) has to hide his horror and disgust at taking on the appearance of the man who killed his son. Travolta (as Castor with Archer's face) is barely able to conceal the delight of a heartless terrorist now able to further torment the family of his nemesis. 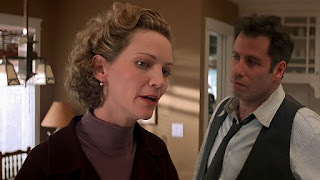 Joan Allen as the long suffering wife provides able support, and Gina Gershon has a smallish but pivotal role as a member of Castor's entourage who provides an unlikely opportunity for Archer to regain his identity. Dominique Swain rounds out the cast as Jamie, Archer's rebellious daughter who has to deal with her dad's stunning behavioural transformation. The climax, when it comes, is a classic mano-a-mano confrontation featuring a wild motor boat chase, several massive explosions, and an assortment of truly stunning stunts. Face/Off is a face-off with epic ambitions to achieve the spectacular, and covers itself in the glory of two worthy rivals refusing to yield even when they see the world through new eyes.